As I only have 1 MAC lipstick it's about time I added a few more to my collection and I really would like to get Viva Glam Nicki Lipstick as I love the look of it although it might be a bit too bright for me. A very basic outfit for a rather dull day. I absolutely adore these leggings, purely because of the leather panels across the knee and down the outside of the legs. So you could imagine my disappointment when I bent down in them the other day and heard a beautiful rip of material. These are a few of the things I've bought over the past few weeks. I also bought 11 books from the library for £2.50 but I didn't think you'd want to see that. Hello, summer in a jar. This scent reminds me of taking my dog for a walk in summer and smells lovely and fresh. I spotted this ages ago in New Look but didn't have time to try one on and I haven't seen one since. Luckily I spotted this one hanging up in all it's glory in a different New Look store the other day. I know it is a bit morbid to enjoy skulls but I do like a skull printed top. I've wanted a blazer like this ever since I saw 2 Shoes on The X Factor wearing theirs but haven't seen one anywhere so when I saw this in New Look on Thursday I had to try it on and it fits like a glove! I don't know what I'll wear it with yet but I love it. I've been meaning to buy a large round barrelled hair brush for a while in hope to get some sort of volume into my flat hair so I bought this when it was 3-for-2 in Boots a few weeks ago. I've only used this once and got it tangled up in my hair which made me cry but I will keep trying. A real must have for a nail art fan! This book is filled with designs for inspiration and step-by-step instructions so you can re-create them at home. Okay, so maybe when he's barking at 3AM at night he isn't so priceless but that's what having a puppy is all about! When he weed on my white carpet this morning he wasn't exactly having his finest moment but c'est la vie! I bought these toner tabs a few weeks ago after reading a blogspot post about them and thought my face could do with a bit of a steam and I have to admit, I wasn't expecting results immediately but I got them. Review coming soon! I'm fed up with scrubbing away at my nails with nail varnish remover and cotton wool so I thought I'd give these a try. Once I try them out I'll let you know if they're any good. I'm finally changing from using make-up remover wipes to a liquid based make-up remover and I saw this in ASDA for £2 so I thought I'd give it a try. I love it! I can't believe I haven't used a lotion based remover before. Goodbye scratchy make-up wipes. I also ran out of my Nivea Toner so I'm giving this Garnier one a try. So far so good! I have heard a lot about China Glaze Nail Lacquer in the shade Flip Flop Fantasy so decided to treat myself to it. Flip Flop Fantasy is taken from the China Glaze Poolside Nail Collection for 2010. It is a beautiful neon, matte, hot pink. It is bright. Very bright! I applied this on top of Sally Hansen's Double Duty base/top coat and applied a thin layer of Flip Flop Fantasy before recoiling in shock/glee. It is bright. Like I-can't-stop-staring-at-my-hands bright. I loved it! I carried on like a trooper and then applied another coat before realising how streaky this actually applies. It is a matte finish but good grief, is it streaky! The best way to overcome this is to put on a thick layer rather than thin layers which show up the streaks. Like I said, it's a matte finish and I really liked the finished look so I didn't want to put on a glossy top coat so I chose 17's Matte Top Coat instead. I found that this nail varnish/top coat combo lasted just about 3 days before I noticed chipping. I was actually really gutted to take this nail varnish off but needs must and I will definitely be using this nail varnish all summer long! Another plus to Flip Flop Fantasy is that it makes you look really tanned and when you are as pale as me, you need all the help you can get. What a long name! I'm ashamed to say that I only started moisturising recently. I never really thought about it before but I have seen the error of my ways. I didn't really know what to look for when it came to a moisturiser but for now, my criteria is as follows: it has to be light, long-lasting and not appear too greasy on the face. Fortunately this moisturiser ticks all the boxes and it is the Garnier Fresh Essentials Hydrating Day Care Moisturising Cream. The moisturiser comes in a cute little 50ml pot. For 50ml you get quite a lot for your money. I've been using this everyday for about four months and I've used up about 1/4 which goes to show it is very long lasting. As soon as you open the lid the lovely fresh smell is apparent, honestly, it smells lovely! The moisturiser itself is a greeny/pale yellow colour which I was quite surprised about and wondered how it would look on my skin but once rubbed in it is transparent. I was worried about how this would be underneath my make-up but as it is so lightweight on the skin it's barely noticeable. I find that a 10 pence piece is enough to moisturise my entire face so a little does go a long way, however the moisturiser is quite thin. It isn't greasy at all either and soaks into the sink really quickly. This moisturiser makes my skin feel really soft and any dry patches on the face are quickly cleared up. I am really impressed with this moisturiser and will definitely be repurchasing. I recently picked this little beauty up in Boots recently as I was drawn to the shade. I purchased 17 Lasting Fix Nail Polish in Woo Me. Woo Me is a lovely light lilac, practically the same colour that I used to have on my bedroom walls when I was a child so it is no wonder I was drawn to it! I don't own any colours like this at the moment so it's a welcome addition to my growing collection. 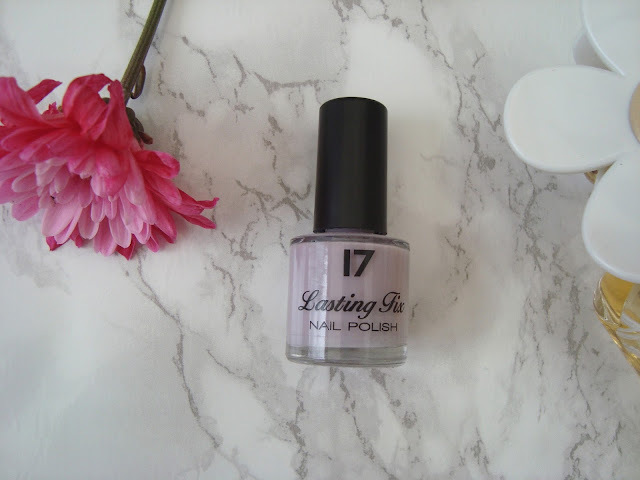 This pastel nail varnish is perfect for summer and I can see myself wearing it a lot in the warmer months to come. I wore this on top of Sally Hansen's Double Duty nail varnish and it needed 2 coats to become opaque. I then applied a top coat and it lasted about 2 days before I experienced chipping. I do really recommend this nail varnish, I absolutely love the colour and I guess I can live with minor chip-wear. For Christmas I received a custom FashionistA Palette which was filled with 3 gorgeous eyeshadows and a lovely blusher. You can buy everything separately on it's own or you can buy a palette which you can customise. Here is what I received! Embellished is a lovely deep purple which will be perfect for a smoky eye look. I haven't used this yet but it looks lovely in the pan. Amber Glow is a gorgeous peachy coral blush with a shimmery gold running through it. This was the first shade to stand out to me and I am really looking forward to wearing this in the summer! Sultry is my favourite eyeshadow out of them all and I've worn this numerous of times in the past few weeks. It's a gorgeous deep taupe and is perfect to wear on it's own. I absolutely adore the look of this eyeshadow. Look how pretty it is! I was intrigued about the gold and the blues together but they blend really well. It is not as pigmented as the other shades but lovely nonetheless. Amber Glow, Embellished, Sultry and Globe.